This is now a flavor of ice cream. It is at my Mythical Ice Cream Shoppe, along with flavors such as Unusual Unicorn, Tarrasquetastic, and Manticore Mango! I’ve always been rather more fond of chocolate chimeras than of mythical ice cream, myself. Does your Ice Cream Shoppe also sell the ice cream created by Ozzy’s mom? No, that would be the flavor know as Divine Plot Device. 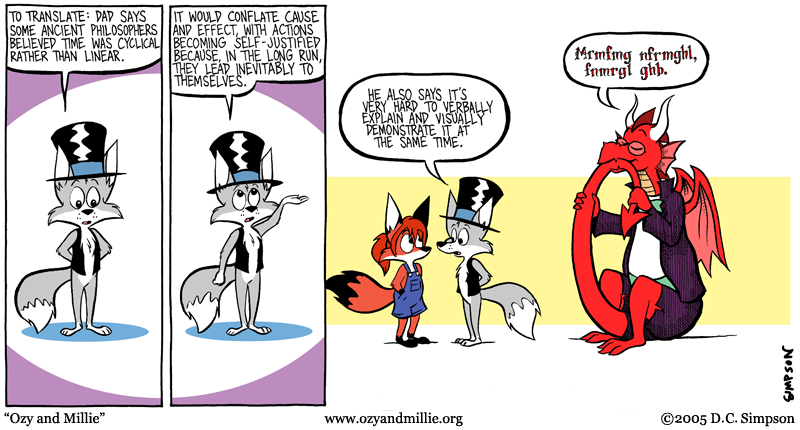 I think this strip might have created a logical loop of it’s own, or maybe something in my brain is just wired to itself. Can someone translate “Mrmfmg nfrmghl fnmrgl ghb” from fullmouthese? That’s what Ozy just did. And that’s the last time Ozy let Llewellwyn play Ouroboros.